I remember the first time I tried dragon boating. It was a chilly and drizzly early evening on False Creek in Vancouver. As I donned my PFD and walked toward the boat with my fellow paddlers, I admit I wondered if this was a sport for me. I mean, these people go out on the water even when it’s cold and raining. Who does that? But it didn’t take long for the allure of dragon boating to become apparent. The thrill of moving a very heavy boat filled with 21 other people, all of us paddling in unison, the boat cutting through the water and the spray from the paddles splashing our faces—it was magical. All too soon my 30-minute introduction to dragon boating was over. I climbed out of the boat and onto land, soaked yet stoked to try it again. Dragon boating has a long and rich history. The origin of the sport dates back 2,000 years in ancient China. Apparently, the first dragon boaters were superstitious villagers who would race on specific days to encourage the rains that were needed for their crops. To the Chinese villagers, the dragon was the symbol of water, so racing in boats decorated as dragons was a way to appease the creature thought to rule the rivers and seas and dominate the clouds and rain. Today, dragon boating isn’t conducted to encourage rain, but it is conducted to encourage fitness, fun and friendship. Dragon boating is the fastest growing aquatic sport in the world, with more than 50 million participants worldwide. In fact, dragon boating has something for just about everyone. It is a sport that provides an adrenaline pumping and exhilarating full body workout for people of all ages, skill levels and physiques. Even people who never thought of themselves as athletes can find a place to thrive on a dragon boat. Dragon boating is all about teamwork. When the dragon boat moves through the water it should look and move as one entity, not a boat full of 22 individuals. That’s because dragon boating is not about individual skills—everyone in the boat must work together and paddle in perfect unison to move the boat effectively and efficiently. A dragon boat race is won or lost in the timing of the team. In fact, timing, pacing and form are more important than brute strength when it comes to dragon boating. As a result, dragon boating exemplifies human connectivity and teamwork on a level comparable to nothing else. Modern dragon boats are 48-foot long canoe-like vessels. During races, the boats are usually decorated as dragons, with ornately painted carved heads and tails. Most boats weigh more than 300 kilograms when empty and can weigh more than two tons when filled with a standard team. Most teams consist of 20 rowers as well as a steer-person, or cox, who controls the boat from the rear, and a drummer who sits in the front. Though dragon boating originated in China more than 2,000 years ago, it was introduced to Canada at Expo ‘86 in Vancouver. Since then, the sport of dragon boating has grown tremendously. There are now more than 250,000 dragon boat participants across Canada, where most major cities host a dragon boat festival, and many of the larger Canadian communities have a dragon boating club. 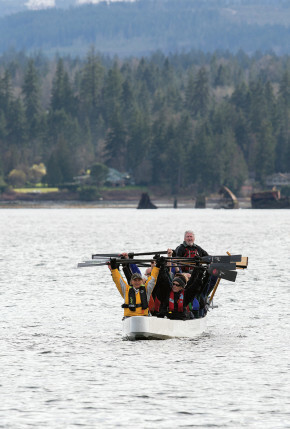 The Comox Valley has dragon boated for more than 10 years. In fact, our community boasts six dragon boating teams. Flying Dragons, Blazing Paddles and Hope Afloat are the women’s teams; Dragon Flies and Prevailing Wins are mixed teams; and Dragon Riders is the youth team. The six teams share four boats which are moored at the Comox Bay Marina. The marina is also where team members meet to begin their weekly practices. Three members of the Prevailing Wins team have now joined VI Paddling’s Gorging Dragons team, based out of Victoria. These enthusiastic paddlers even travel to Victoria every Sunday to practice with their southern teammates. And as members of the Gorging Dragons team they will travel even farther—to Adelaide, Australia in April of 2016 to take part in the World Crew Dragon Boat Championships. Lister believes that dragon boating is a sport that would appeal to many young people. “Pretty much anybody—people with all sorts of personalities and physical abilities—can pick up a paddle and have fun,” he says. Though the youth team is all about having fun, there is a serious side to the team as well. In fact, they are a very competitive youth team that has successfully completed many events, often placing in the top ranks and mostly against adult teams. “The kids love the races but they’re incredibly good at them too,” says VanNoorden. 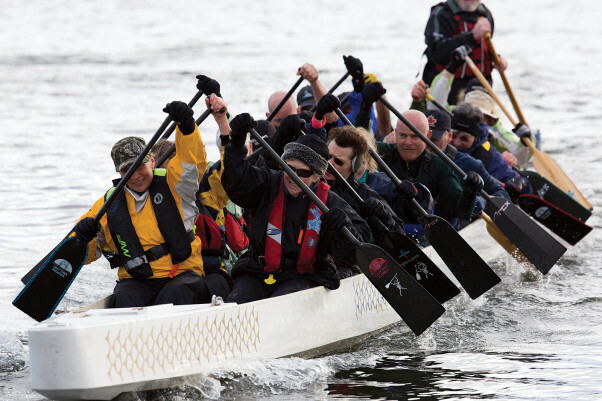 If you are interested in trying out the sport of dragon boating you can stop by the tent that will be set up at the Comox Marina launch ramp on April 23 from 11-3. No previous experience is necessary as full training will be given on the day. The boats will be ready to go, and paddles and PFDs will be provided—so be ready to get in the water and have a great time.